Twitter gave the world a special look at the Winter Olympics in Sochi, Russia—and the view wasn’t always pretty. The Twitter handle @Sochi_Problem documented all of the Olympic’s “whoopsie” moments, from bobsledders locked in elevators to stray dogs in a journalist’s hotel room. But for every Tweet reminding us that it only costs $2.5 billion to land on Mars—and $51 billion for Russia to host the Games—there was @JohnnyGWeir Tweeting pics of his fabulous blazers, @JayOnrait with hilarious commentary on the games, and a handful of NHLers-turned-Olympians flexing their social media skills. Arguably the cutest Tweet on this list, Chicago’s Patrick Sharp shared this photo of himself and his adorable daughter on Instagram before heading to Sochi. Like father, like daughter, complete with matching ponytails—you can’t find Tweets more awwwww-inducing than this. 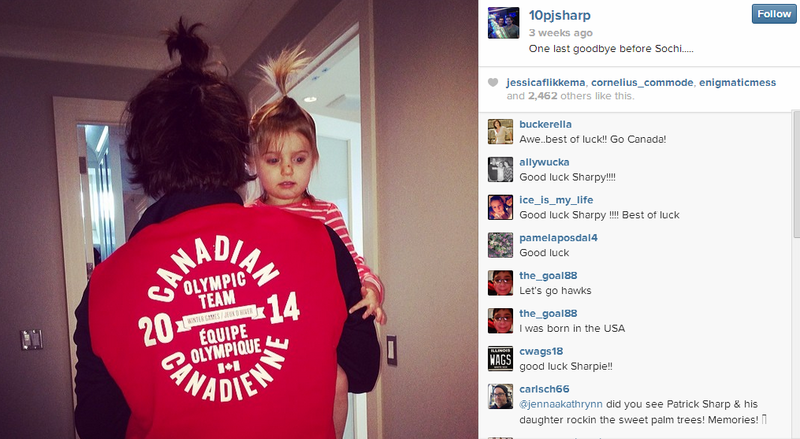 Patrick Sharp and his adorable daughter sport matching ponytails. Sochi’s many stray dogs struck a chord with Olympic athletes. But before the world got emotional over photos of Silver Medal freestyle skier Gus Kenworthy literally hugging an armful of homeless Russian dogs, Paul Stastny was pampering a pooch of his own. 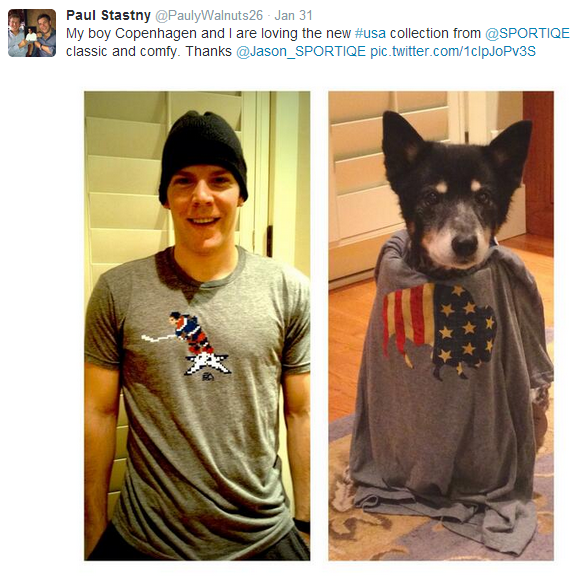 Before departing for Sochi, Paul and his puppy Copenhagen modeled USA-themed Sportiqe t-shirts. Copenhagen should consider a career in modeling. Paul Stastny and his puppy Copenhagen test out modeling careers. Michael Grabner added his voice to the many congratulating Team USA’s TJ Oshie on his stellar shootout performance against Russia. Helping out fellow athletes… this counts as Olympic spirit, right? Michael Grabner congratulates TJ Oshie on a job well done in Sochi. 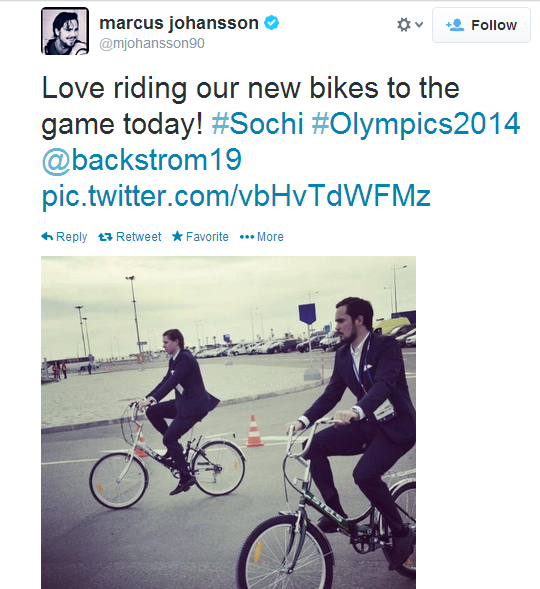 Apparently, Team Sweden is a fan of traveling by bicycle (see Marcus Johansson’s Tweet for further evidence of this). But with a nicknamed like King Henrik, you wouldn’t expect New York Rangers’ goalie Henrik Lundqvist to peddle himself around Sochi, would you? 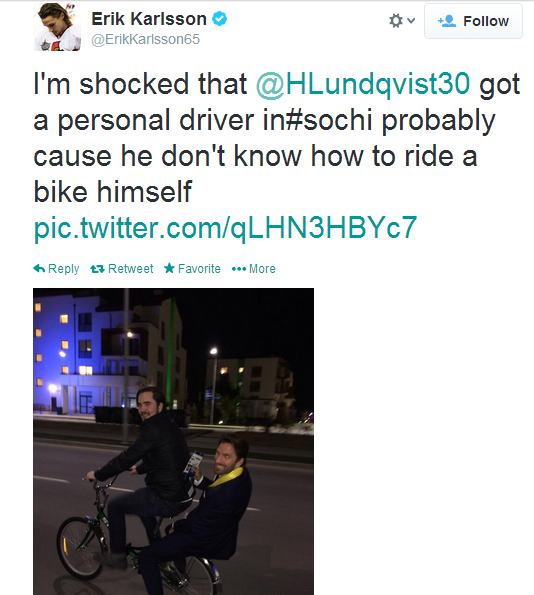 Henrik Lundqvist hitches a ride on the back of a bike in Sochi. The Olympic Village in Sochi is sprawling. So, what better way to get around than by bicycle? Marcus Johansson Tweeted out a photo of himself and Washington Capitals’ center Nicklas Backstrom in what appears to be a very well-dressed biker gang. A Swedish biker gang in Sochi. Usain Bolt recently admitted to eating an estimated 1,000 McDonald Chicken McNuggets while competing in the Beijing Olympics. While on his 100 McNuggets-a-day diet, Bolt managed to win three gold medals. 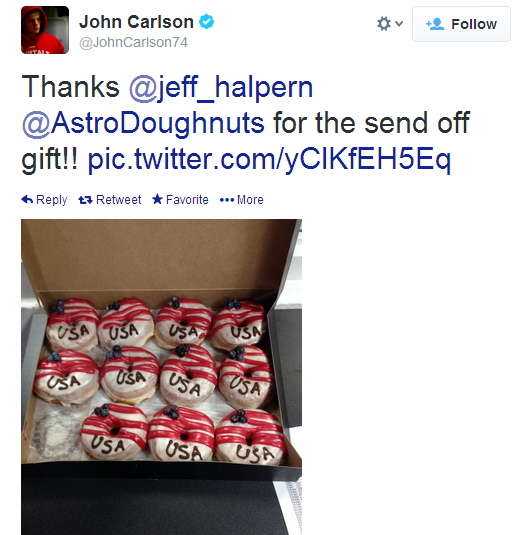 With this in mind, we shouldn’t be too concerned that John Carlson has decided to carb-o-load for the Olympics with some American-themed doughnuts, courtesy of the Phoenix Coyotes’ center Jeff Halpern. John Carlson and American-themed donuts. Perpetuating the reputation of goaltenders being a teeny bit peculiar, Roberto Luongo is one of the funniest Tweeters in the League. 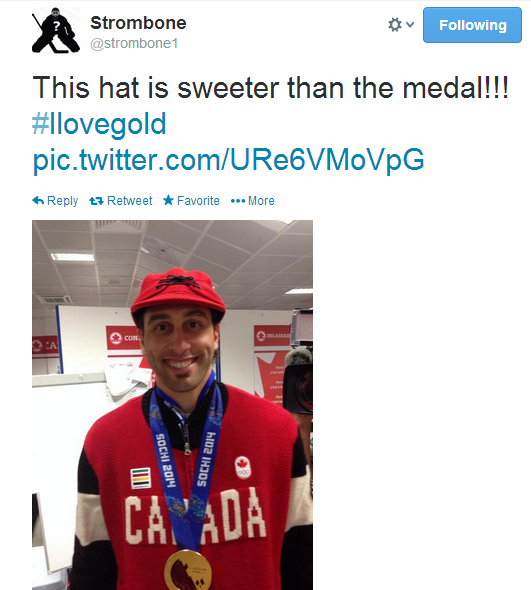 Tweeting under the pseudonym Strombone, you can check out his 26 best Tweets in 2013 over at Pass it to Bulis (Luongo’s Tweets are truly worth a browse). What’s better than a Gold Medal? A very Canadian hat, according to Luongo. The Canucks backstop celebrated Canada’s Gold Medal win with an ear-to-ear smile, a gold medal around his neck, and cheeky Tweet about the Far North’s Closing Ceremony ensemble. Roberto Luongo sporting Team Canada’s fashionable Closing Ceremony outfit. Annie Erling Gofus writes for Olympus Athletics. Follow Annie on Twitter (@AnnieErGo) or email her at annie.erling@gmail.com.